Exterior paint schemes can make or break the effect of a dollhouse or model building. Depending on the scale, the relationships between color or hue, tone or value, and chroma or intensity of the paints chosen can accent or play down design lines. Tone or value is the lightness (or darkness) of the color. Hue is how artists refer to the differences in the colors. All of these things come into play when deciding how to paint the exterior of a model building. If you are going to be creating entire streets, you will also have to take into account which items on the street you want to draw to the viewers' attention first, and which items you want to downplay. We've used a simple three-tone, or three color exterior paint scheme in the following pages to demonstrate some of the differences that occur depending on how you lay out your exterior color scheme. 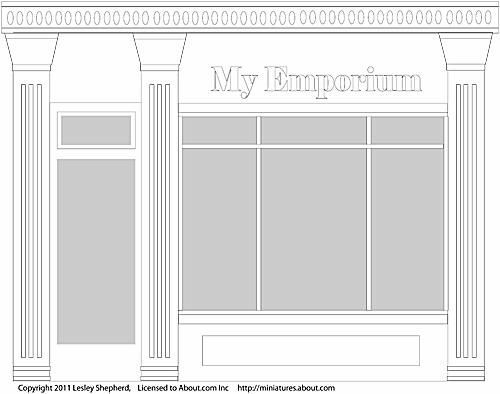 A pdf version is included of an outline drawing of a shop front you can print off to experiment with color schemes for your own projects. Before you begin designing painting schemes, it also helps to have a basic understanding of how we perceive colors. First, you need to understand how tones or values of color look different depending on the tone of the color they are shown against. The painting guide has a great illustration of how tones relate to other tones. The same color will appear much darker or brighter, depending on what it is viewed against. The color wheel is another important aspect of understanding how to design paint schemes. ​Complimentary colors make each other seem brighter, and incorporating them into your color schemes can give your exterior some dramatic effects. Try using an easy Hue Test, where you arrange colors like a rainbow, to see if you can distinguish and arrange similar colors. To begin working out an exterior paint scheme, make a sketch of the building exterior or take a photograph set to black and white. Choose which parts of the building you want to accent, and decide if you want them to be dark, which will make them appear to recede or go back, or light, which will make them come forward. In addition to light and dark versions of grey (you can draw these in on a sketch with a pencil), you will also use a mid-tone grey as your main color. In my sketch above, the windows show as a fourth shade of grey, just to help keep them separate from the design for the paint scheme. As you work with a simple pencil on a sketch of your building, you'll find that areas you thought you would highlight, are too close to areas of the same color, so you will have to adjust where your three gray colors fit in the greyscale scheme. When working from photos of your own buildings, try starting with the items you want to showcase, the window surround, the door, the featured moldings. In general, to emphasize architectural details, try to outline them with an accent color that contrasts with the background or main color of the building. Use dark colors where you want to pull a viewers eye into an area or emphasize shadows, and use lighter colors to help "push" out or project other elements of your building exterior. Once you have your greyscale sketch or photo of your building exterior to show you where to repeat your three chosen colors, it is time to pick the type of color scheme you want to use. Notice that we still haven't talked about picking the actual colors; this is all the process of working out the design of the color scheme, which will work with the colors you eventually choose. Three Simple Systems of Choosing Colors - Although you can make color schemes work with any method of picking colors, there are three methods that make it easier to get the effects you expect. In the three schemes laid out in the photo on this page, the colors all follow the pattern of repeat laid out in the greyscale version created to highlight and shade the various parts of the building deemed as important. Monochrome Color Schemes Monochrome schemes can be very effective and rely on different tones of the same color. Here you can see a monochrome brown scheme with a light, dark and mid-tone laid out according to the color pattern chosen on the greyscale drawing. A monochrome scheme can be laid out with very strong contrasts (image black, white and grey), or it can be laid out with colors closer in value to each other. Monochrome color schemes can be very polished and formal, or fun and bold, depending on both the main color you choose and how wide apart the color values or tones that you choose. High Contrast These schemes can be based like the one shown on two primary colors (here yellow and blue) and the secondary color which is made by combining the two primary colors (green). These schemes have harmony due to the relationship between the colors, but can also have very high contrasts, depending on how you set the values and balance for the various colors. Equal Values - the equal value color scheme here uses similar values (light or dark) of three primary colors, here pink, yellow and blue. All the excitement of this type of color scheme is caused by the colors or hues themselves, as the colors are all equal in tone. Even without any extra contrast caused by darker or lighter colors, the colors alone can be used to accent various sections of the exterior. Schemes that use similar values tend to have a lot of contrast across the design, regardless of how the colors are placed. There are no subtle shadow effects when all the colors are of equal value. Once you decide which three colors you want to use for your basic paint scheme, you can still create a wide range of different variations. In the samples laid out in the photo above, we used the olive green as the light tone, the dark green as the mid tone and the red as the dark tone. This is closest to the values the actual colors have and shows how well my color scheme works directly from the grey scale to the actual paint scheme. Even after you choose your colors however you can create very different effects by just moving the colors through the scheme. Look at the difference in the effect when the red is used for the mid-tone areas of the grey scale scheme, or where the olive green, the lightest tone, is changed over to the mid-tone areas of the color scheme. These are still the same three colors, but in varying amounts, and used for different parts of the exterior, they create very different effects. For miniatures and model buildings, color balance needs to be tweaked in order to pull attention to the areas you want to focus on. Using the same three colors as the previous paint scheme, notice how slight changes take your eye to a different part of the shop front. Putting most of the strongest color around the window area pulls your eye to the windows first. Putting some of the strong color above the shop name draws your eye to the top of the shop and the name. Adding a strip of strong color to more of the area along the top edge of the shop balances the front windows and the sign, and leaves a neutral zone below the window where you can feature items from the shop without creating a high contrast. Adding the strong red color below the window as well as along the top of the box balances the shop front and gives you another space to feature writing while keeping the focus on the windows. Experiment with the colors you use for your paint schemes, but also tweak layouts to get the best effect in a small space. As many of your contrasting colors will be used in very small amounts, depending on the scale you are working in, pay attention to the values or light and darkness of the colors, as well as their relationship to each other to get the strongest possible exterior designs even using very small detail areas.